Remind your loved ones to find the beauty in the rainfall with Emilie Shapiro's stunning bangle. 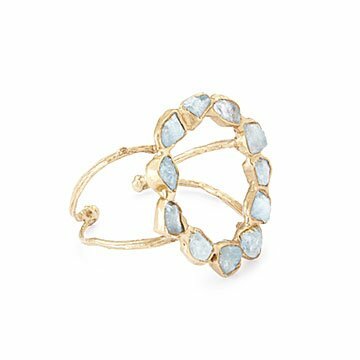 Like the imperfect beauty of every raindrop, Emilie Shapiro places rough aquamarine stones in her stunning bangle. Her intention is twofold: To help bring the calming, fresh tones of a shower to your wardrobe, but also to remind you to find the silver—or in this case, brass—lining in any situation. There is also the cyclical nature of the design as a gentle expression of how life comes full circle. However you assign meaning to the piece, it makes a sentimental keepsake for close friends and mothers alike. Handmade in New York. Wipe clean with a damp cloth and avoid harsh chemicals.